Hello and welcome to my web pages. This is my expanding universe. When I get the time I will be adding my images and articles on science, science teaching, astronomy and astrophotography. If you have any suggestions or contributions you would like to make or you would like to get in touch with me please go to my contact page and send me an email. I have been fascinated with astronomy since I was young and now in my work as a science teacher and observatory tour guide I get to share my fascination with others. This web site is intended as an extension of sharing my interest in astronomy and I hope you can take something away from your visit. 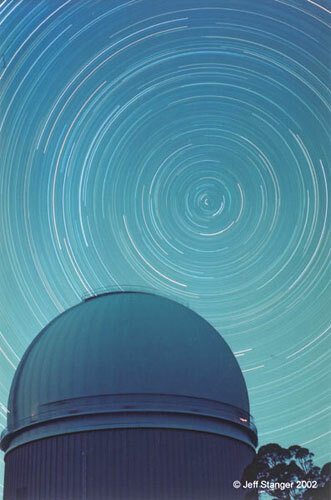 This long exposure photograph shows star trails over the Anglo-Australian Telescope (AAT) near Coonabarabran NSW. These star trails are due to about 4 hours of the Earth's rotation and you can learn how to take photos like this here.